Our Annual Winter Solstice Celebration is Thursday, December 21! Midwinter’s day has been an important time for celebration throughout the ages. On this shortest day of the year, the sun is at its lowest and weakest, a pivot point from which the light will grow stronger and brighter. This is the turning point of the year. To celebrate this sacred time we will begin with an inspirational intention setting, followed by yoga, a meditation, and immersive sound experience. Live music will enhance our sacred experience with ambient soundscapes as we practice. 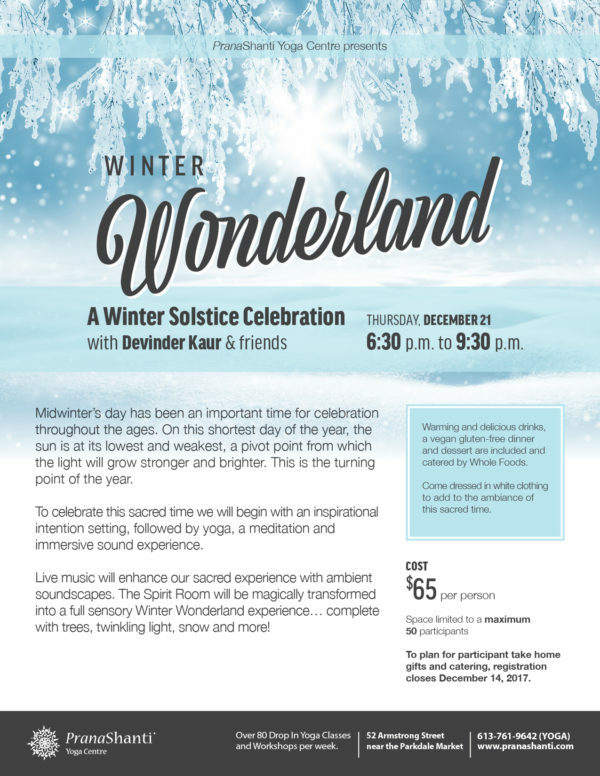 The Spirit Room will be magically transformed into a full sensory Winter Wonderland experience…complete with live tress, twinkling white lights, snow and more! Warming and delicious drinks, a vegan gluten free dinner meal and desert are included and catered by Whole Foods. Please come dressed in white clothing to further add to the ambiance of this sacred time. Limited space for a maximum of 50 participants. To plan for participant take home gifts and to confirm catering, registration closes December 14, 2017.